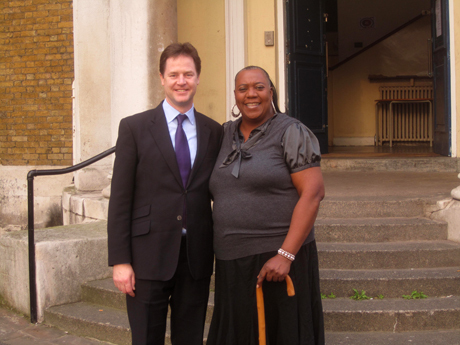 Nick Clegg visited Hackney on Friday 23 March to meet with ‘Hackney Heroine’ Pauline Pearce, who will stand for his party in the upcoming council by-election in Hackney Central ward. The Deputy Prime Minister spoke with Ms Pearce at a meeting of Liberal Democrat members and local residents at St John at Hackney Church, where they discussed violent crime and the lack of opportunities for local young people in the borough. Pauline Pearce gained national fame and admiration last summer when a video of her confronting local youths during the August riots made its way onto YouTube, whilst the brick wall in the video has apparently become a popular backdrop for tourist-style photographs. The council byelection will take place on Thursday 3 May.